Early in 2013 as Fourth of July approached Lee and I started to wonder if we could use LEDs as a “firework.” Could we take the pyro out of pyrotechnics? With the varied colors and types of LEDs we became confident that we could create a night sky full of colors. But, could we create the “ooooh and ahhhh” moment that fireworks evoke? We started by writing down some ideas and we began experimenting with delivery methods. We tried launching LEDs in to the night sky with with rubber bands, airplanes, helicopters, we even tried just throwing them in the air. We decided we needed more power and we turned to soda bottle water powered rockets. That was it, these rockets had enough power and we could make a nose cone to put all the LEDs into. We had our delivery device, now we needed to find methods to create the light show. We tried various combinations of LEDs with streamers, propellers, and parachutes. The parachutes had a slow descent and any breeze would flip them around and make the effect more random. The slow descent in the night sky led to what we call the stare – folks just looking up waiting, waiting, to see where this light was going. It was the “ooooh and ahhhh” moment we were looking to re-create. 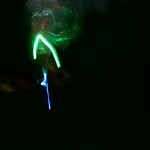 We had the formula for our first LED Firework, a soda-bottle water powered rocket loaded with LED parachutes. Then something happened – it rained. We were stuck indoors and we needed to test some new parachute designs. At that moment we realized that at Maker Faire we would be indoors as well. Even if we were outdoors, launching LEDs in the day would not be that spectacular. On a lark we tossed one of the LED chutes over a fan in my living room. We watched as the LED chute flipped around then shot up, hit the ceiling, came down, and then went back up again. We found ourselves playing with the LED over fan for the next half hour. The next day with the rain gone we decided to take the fan outside so we could see how high we could launch these chutes. We tossed the LED chute over the airstream of the fan and the chute shot up much higher then we expected. Maybe 40 feet in the air. We grabbed some more chutes and began tossing them into the air stream. Sometimes the chute would flip around before heading up into the air. Others times it would only go a few feet and then fall. We did not fully have the tossing technique down but it was clear that it was addictive. Once we started we did not want to stop. We spent over an hour playing and trying different techniques to get the chutes to go higher. We were hooked we had the “ooh and ahhhh” experience we were looking for. That is how the LED CHUTIE was born.